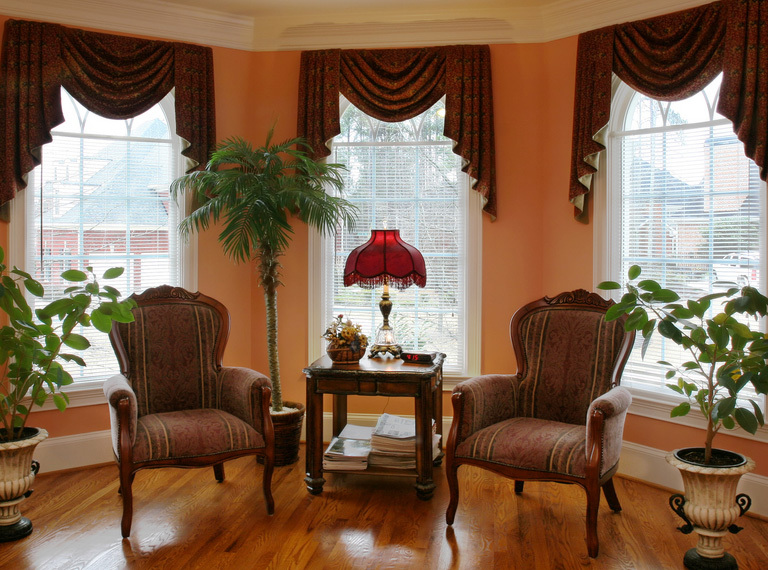 Purchasing new window treatments is an investment in your home. There is a wide variety of ready-made shades, draperies, and blinds on the market, but custom products are the best way to ensure a unique representation of your personal style. Purchasing custom window treatments rather than ready made blinds or drapes also ensures that you will be working with a professional who can give you advice along the way for the best quality products at the price you have determined. The options that open up to you with custom window treatments give you the opportunity to choose something you love rather than just “what’s available”. A website ordering system cannot offer you the service and confidence that a window treatment professional working closely with you in your own home, based on your style can offer. With custom window treatments, you can choose from unique fabric prints and colors that perfectly complement your home’s finishes, furniture, and decor. Your opportunity to look at swatches, compare them to your current furnishings and admire them in the natural and ambient lighting of your home allows you to choose wisely. When you select custom window treatments, you have nearly unlimited choices for the look and design of your windows. Choose custom fabrics for use in other items in your decor, such as pillows or upholstery, so you can pull your room decor together with a cohesive look. Not only do you have a TON of fun, fabric options, but there are a wide variety of pleat and fullness choices, so let your imagination run wild because we can make anything that anyone comes up with. You won’t get this benefit with off-the-shelf curtain options which usually only come as 1 panel 54” wide at 96” or 102” long. Why put yourself in a box? Let us help you create something that blows non-custom products out of the water! When you choose custom window treatments, each window is measured to create blinds, shades, draperies or shutters that fit with precision. This is especially important when you have unique window shapes and sizes that require an unusual window treatment to create the right look. Width, length, depth and the perimeter shape are all carefully considered when you select custom window treatments that enhance your home and your lifestyle. We think about everything else, such as ease of operation, proper installation, child safety, the weight of the product, dye lot differences, and more! Not only do we help you create the ideal window treatments for your space, but we install them for you as well. Custom window coverings should receive custom installation as well to ensure they really do fit like a glove. With our installation, you’ll love the perfectly positioned setup and feel confident about it being done right the first time. I am proud to be a 3rd generation window treatment expert, having practically grown up in a manufacturing plant which gives me an innate understanding of window treatments and the issue that can arise. This is why we can fix the most common issues onsite without having to send the product back to manufacturers saving you time and allowing you to enjoy your window treatments sooner. Austin Blind Faith is also one of the only companies in central Texas that can actually fix shutters! As a long-term investment in your home, custom window treatments are designed with high-quality materials that will last for many years. When you choose timeless colors and fabrics, they will never go out of style and can endure through design trends and changes to your furniture, flooring, wall colors, and art. Custom window treatments can also add value when it comes time to sell your home, especially if you have unique window shapes that require custom designs. A rushed job with ready-made window treatments will look like a bargain choice, and they won’t provide the sophisticated look you desire for your home. Austin Blind Faith Offers Service Above All Else! When you contact Austin Blind Faith for your window treatment needs, we’ll come to your home for a free in-home consultation and take care of all the measuring for your new custom products. We’ll also advise you on the window treatments that will be great choices for enhancing your windows and for energy efficiency. We will share swatches and samples with you to illustrate your many design options. Along with all of the benefits already listed here, Austin Blind Faith offers a 1-year no-questions-asked warranty. We’ll take care of anything in the first year. Even if your dog eats them. Really. Anything. After that, the manufacturer warranty kicks in, but Austin Blind Faith will come to you rather than you having to take the product to the big box stores. Our service is second to none for our individual clients and designer clients alike. Customers even have access to the owner’s cell phone and e-mail. Our company philosophy is built around creating the best customer experience we can possibly offer. We love our life-long clients and are happy to help them year after year with their window treatment needs! Contact us today for more information about our broad range of custom window treatments or to schedule your free consultation. Our comprehensive selection of blinds, shades, draperies, shutters and faux iron means there is an ideal custom solution for all the windows in your home. Our experience and expertise allow us to create a beautiful look for all the windows in your home, and we are eager to work with you to create the home decor of your dreams!